A variety of different Spa’s. French holidays are about relaxation and enjoying a well deserved rest. 10 minutes away and you are in the truly luxurious “Caliceo” in Dax. This is not to be missed. So if your body could use a bit of t.l.c and you want to spend a day indulging in a well deserved treat, pamper yourself in the various natural mineral hot springs. Dax is well known in the area for its natural hot springs dating right back to the Roman times,when Julia The daughter of the first emperor Octavian Augutsus ,visited Dax for Spa reasons. Later Henry 2nd and the English had there time ruling France and enjoying the hot springs of Dax until1451 when the French took France back. So Dax is worth a visit with its amazing architecture down town and luxurious Spa. 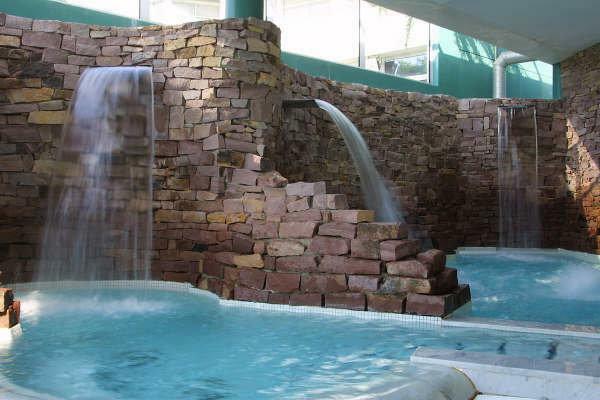 It offers inside and outside thermal pool, with jacuzzi, sauna, haman and many other places to chill. €14 /2 hours adult’s €11 kids.